Please be advised your Negotiating Committee has reached a Tentative Agreement with the Steamship Authority and there will be (2) Contract Ratification Meetings held on Mondav, August 11, 2014, at the Cape Verdean Club at 126 Sandwich Road in East Falmouth, MA. First Meeting - will commence promptly at 8:00 a.m. Immediately following a review and discussion of the Tentative Agreement, a secret ballot ratification vote will take place. The votes from this first meeting will be secured and counted together with the ballots from the 3:30 meeting. Second Meeting - will commence promptly at 3:30. Immediately following a review and discussion of the Tentative Agreement, a secret ballot ratification vote will take place. At the end of this vote, the ballots from the first meeting will be added and the count will begin. At the end of the counting, the results will be announced to those in attendance. We strongly encourage all members to attend as you must be present one of the meetings to vote. By overwhelming numbers, the Captains and Pilots charged with transporting passengers to and from the islands of Martha's Vineyard and Nantucket voted to join Local 59. These employees join with 200 other fellow employees at the Authority who are covered by Teamster Collective Bargaining Agreements. "We are very excited to be working with the Captains and Pilots," said George Belanger, Secretary-Treasurer and Executive Officer of Teamsters Local 59. "These employees provide a vital service to the Bay State by safely transporting passengers, vehicles and goods to and from the Islands. We look forward to securing an Agreement for these employees and we welcome them to the Teamsters." Eight Ryder Truck Rental and Leasing employees at the New Bedford Facility recently voted to become members of Local 59. The vote, taken on December 20, 2012, was overwhelmingly in favor of union representation. We look forward to working with the members in securing their first contract. 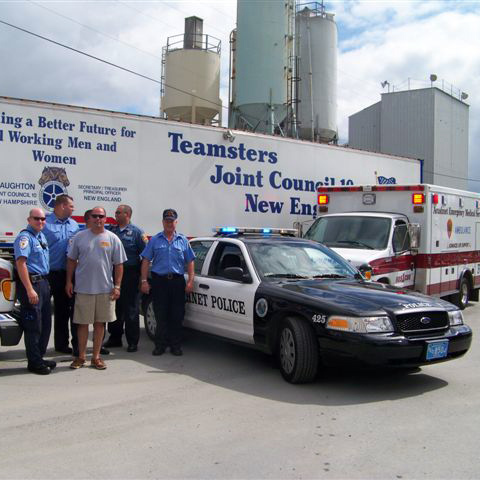 The Falmouth Maintenance Department approached the Teamsters to represent them after speaking with the Falmouth School Custodians who are Local 59 members. The dedicated maintenance employees felt they were being looked over by the Town and concluded in order to achieve their goals for themselves and their families, joining the Teamsters was the solution. Negotiations were challenging at times, however, in the end their proposals became a reality. It is important, we as Teamsters spread the word of how beneficial a Union Contract is for a secure future. On behalf of Local 59, we welcome all our new members and look forward to working with them. Our Local Union would like to take this opportunity to introduce information to you regarding our Teamsters Union. Teamsters Union Local No. 59 is an established Union serving Greater New Bedford, Cape Cod and the Islands, representing members in a wide range of trades, from the public sector to private industry, since 1933. Over the years, the Teamsters Union has supported worker's issues, many of which resulted in both Federal and State Laws such as Child Labor Laws, Minimum Wages, Health and Safety (OSHA) on the job, the Family Medical Leave Act, American Disabilities Act, and protection of worker's rights guaranteed by the National Labor Relations Board. 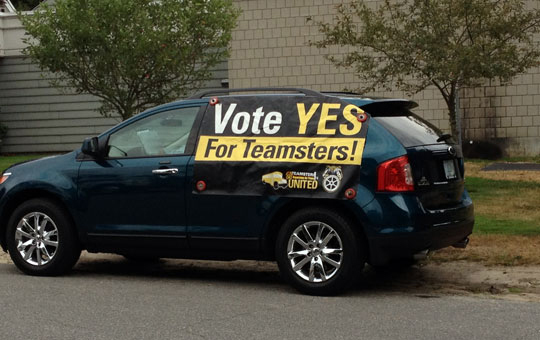 As a Teamster member, You decide what goes into your contract and vote to accept or reject it. You also have a vote every three years to decide who will be the business representatives for the Local Union. Today, workers should know that discrimination and favoritism rob people of opportunities for advancement. Workers know about inadequate health benefits that threaten the well-being of their families. Workers know about the lack of dignity that exists when people are denied a voice in their working lives. The Employer controls out of Fear - not out of Respect. A Worker's greatest asset is Courage. The ability to stand against mistreatment, threats, or rumors, and to realize that under the Law, workers have the right to join the Union of their choosing, to provide job security for themselves and their families. This decision that you are about to make is important, get the real facts. Organize today, provide for tomorrow. A Union is more than just a Collective Bargaining Agreement. It is more than the improved wages and benefits that come with a union contract. A Union is more than the leadership and staff, the lawyers, negotiators, educators, and economists who assist us. The Union is the people themselves, joining together in a triumph of hope over fear, standing together for justice, and having pride in our Union and in Ourselves. We firmly believe our Local Union can achieve a greater standard of living for you and your families and increase respect and fairness from management on the job. If you are interested in joining our organization, please Contact Local 59. Please remember, all calls are kept Confidential. The only way to gain a voice on your job and the protection of a legally binding contract is through collective bargaining. It's not an easy process, but 1.4 million union workers are supporting you 100%. It's your job, your family, your future - get it in writing! To be strong we must be united! Vote Teamsters for a better future! Who runs the Teamsters Union? You do! "You" run your Local Union affairs democratically, as responsible members of your union.YOUR UNION. "You" elect Local Union Officers by secret ballot vote. Every member who meets the eligibility requirements may run for office. "You" determine proposals covering wages, hours of work and all other conditions of employment for your bargaining unit. "You" will not pay any initiation fee as a newly organized group. "You" will not pay dues until you have a contract. "You" make the decision by secret ballot and vote to accept or reject any contract negotiated with your employer. "You" are the final voice of authority in your Teamsters Union.